She creates eye-scorching squares that look like digital confections. But they’re actually painstakingly handmade – and nothing you see here is really in colour. 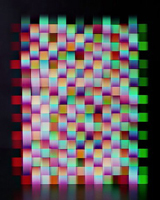 Hip to be square: Jessica’s Eaton’s kaleidoscope art – in pictures. “Theoretically there’s no such thing as a colour photograph,” Jessica Eaton tells me authoritatively as she guides me around her debut British exhibition, Ad Infinitum – though her brightly coloured geometric photographs dramatically refute this statement. Her images are, in fact, complex illusions made by the inner workings of her analog camera. Eaton uses light the way painters mix colours. Her images nod to colour field painting, Bridget Riley, Josef Albers and Sol LeWitt. And her end results are both formally beautiful and, the more you look at them, mesmerising in their tonal depth. This Canadian-born artist has created a considerable buzz of late – and now she has the backing of the Photographers’ Gallery for this show at the Hospital Club, in London’s Covent Garden. For more complex cubes, Eaton flips over the back of her camera and shoots more than one cube on the same piece of film. And for her blurred, retinal-scorching squares, she even moves the camera up and down as she shoots. Intense and intellectual, even when hungover and jet-lagged, as she is when we meet, 36-year-old Eaton is the hottest photographic artist to come out of Canada since Jeff Wall. To acknowledge this, the Canadian cultural attache opened her London exhibition with a speech that mixed deadpan humour and obvious pride in her achievements. Born in Regina, Saskatchewan, Eaton currently lives and works in Montreal, a city more renowned for its groundbreaking rock – Arcade Fire, God Speed You Black Emperor – than its art. Next year, she will relocate to New York and embark on her next exploration, of still lives of flowers. That is as pertinent a question now as ever it was.